What is Love..? Do You Know? Do you ever ask yourself, “What is love?” “What does it means to be in love?” or to love someone else? It’s always difficult to try to explain what love is. It’s very similar to explaining what God is. It can be difficult and yet we may not all have the same understanding of what they mean. That is fine, because we’re all uniquely different and our experiences are diverse and we perceive things differently. Love is difficult to explain sometimes but it’s an innate knowing. In many ways I think it would be wrong for me to tell you what love is in this post because you may not agree, and that too in and of itself is OK. We can share similar views on Love, or I may be able to articulate what I feel Love is and you can agree with it because you’ve experienced it in a similar way. What I do know for sure is love is easier to understand when we’re able to explain why we love someone. This task can be simple, or it can be a struggle for us. It doesn’t necessarily mean that we don’t love someone, what it may imply is that we don’t know what love looks like within ourselves. When we see it in us, in the mirror, it’s easier to recognize it in others. Love is something that we already have. We are it. We are Love. We must stop looking for something somewhere in someone else when we already have it. You are Love. I’m Love. You’re Love. We’re Love! We look for love everywhere except from within. As children, Love is often romanticized, making it difficult for us to see that it’s already in us, rather than it being something that supposed to find us. It leaves us to believe that it’s going to come to us through a romantic partnership, but we’re kidding ourselves if we think that this is the only “type” of Love that can exist. The truth is Love is Love. There is only one Love. There are no varying degrees of Love. Love is just simply Love. What I’ve learned about love is that it starts from within. We can’t look for love outside of ourselves. When we do this, it’s a recipe for disaster. It can create problems in our relationships with people. I do believe that someone can come along to teach us about love. I have had many friends and spiritual teachers teach me about how to love myself, without even knowing what they were teaching me. They were just being, just being love. As with many things, love is a practice. It’s not something that you automatically get or understand. 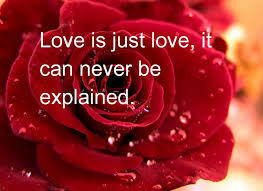 Love is not only difficult to explain, but it can also be a difficult thing to understand and grasp. I feel like I learn something new about Love almost every day. Whether it’s through my daily interactions with people, or something that I read, or some new experience that I have. Love is just not something that we ‘fall into’ with other people, nor can it be acquired, purchased, or accumulated. We can practice being more Loving on a daily basis, by pointing out our best qualities of ourselves. For example, I Love that I am creative…I Love that I am inspirational…I Love that I genuinely respect others, and so on. Pointing out what we Love about ourselves not only improves our self-esteem, but it also encourages us to point out good qualities in other people. We’ll begin to notice in others, what we notice about ourselves. What do you love about yourself? What makes you go gaga over you? When we’re able to see love within ourselves, we’re able to see love in others. We’ll begin to notice the good in people first, rather than the negative. We’ll be able to think more highly of others, rather than passing judgments on people. Don’t think that this type of energy projected isn’t contagious. Once people notice that you only see the good in them, and that you genuinely come from a place of acceptance and love, they will treat you better than they treat others. You’ll see a different side to them when they are dealing with you rather than some other people in their life, they may even find it easy to confide in you rather than their closest friend. The good thing about this too, is that they may also begin to change how they view other people or their relationships. Could you imagine what this world would be like if we had more people who operated from a place of love rather than judgment? Awesome! 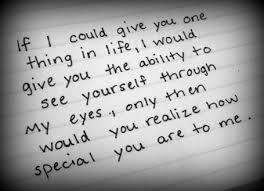 I love this and I love you! !! !